Despite a looming tax credit expiration, developers' interest does not seem to be waning. AUGUSTA – Wind power generated in Maine is now producing nearly 500 megawatts, enough to supply the average needs of 175,000 households. However, it’s still well short of the state’s goal for wind generation by 2015. But new projects that are in conceptual stages, under regulatory review or approved but facing challenges could catapult the state to half of its wind-power goal of 2,000 megawatts by 2015. The Legislature has set that goal for installed wind power capacity, along with 3,000 megawatts by 2020. Maine’s operating wind power plants have a capacity to produce 468 megawatts online now, according to figures from the state Department of Environmental Protection, which regulates grid-scale projects in Maine’s Unorganized Territory. The year’s end brings the possibility of big change to the industry. The federal Production Tax Credit, used to encourage development of renewable energy projects, is due to expire at the end of 2012. That’s caused “very legitimate” concerns among wind power developers, said Jeremy Payne, executive director of the Maine Renewable Energy Association. “It’s a very important piece of development” in wind projects, he said. A national industry group, the American Wind Energy Association, says that with the looming expiration of the credit, wind project developers are not making plans in the United States and American manufacturers are not receiving orders, costing jobs. Developers’ interest does not appear to have waned in Maine, which is by far New England’s largest wind producer but accounts for only a small fraction of total U.S. output. According to the American Wind Energy Association, the U.S. wind industry totaled 51,630 megawatts of cumulative wind capacity through the end of September. Maine has 11 operational wind farms producing anywhere from 4.5 to 132 megawatts, five of which are owned by Massachusetts-based First Wind. They include First Wind’s Mars Hill in Aroostook County, Rollins in Penobscot County, Stetson I and II in Washington County, and its newest, Bull Hill in Hancock County. TransCanada Maine LLC completed the state’s largest operating wind farm, with 44 turbines, in Kibby Township in Franklin County in 2010 and expanded it by 11 at a second site. In Oxford County, Independence Wind’s Record Hill and Patriot Renewables’ Spruce Mountain projects are producing power. The two smallest sites, with three turbines each, are Fox Island Wind LLC’s site on Vinalhaven island in Knox County and Beaver Ridge LLC’s project in Freedom, Waldo County. But several more projects are in process at the Department of Environmental Protection or are expected to be in the year ahead. Their approval and development would bring the state closer to meeting its goals, which is intended to increase the reliability of the region’s electricity supply through indigenous renewable power that will not produce greenhouse gas emissions or other air pollution. First Wind is expected to submit an application by the end of January for a 60- to 65-turbine project that would be built in Kingsbury Plantation in Piscataquis County, the DEP said. It is known as the Bingham Wind Project. Also expected by the end of January is an application for an expansion at Bull Hill. Conceptual plans for projects in Moscow in Somerset County and Alder Stream in Franklin County have emerged. The latter has already gotten a boost from the federal government. In early 2012, the Energy Department awarded $1 million to the Penobscot Indian Nation to help it move closer to developing the 227-megawatt Alder Stream project. The grant is to help with engineering designs, meet permit requirements and identify power purchasers. “We don’t expect an application before 2014,” said Mark Bergeron, director of DEP’s Division of Land Resources Regulation. Meanwhile, the DEP is reviewing First Wind’s revised application to build a wind farm on Bowers Mountain straddling Penobscot and Washington counties in eastern Maine. The new plan envisions 16 instead of 27 turbines as originally proposed, and placing them in less visible locations. Permits have been approved for First Wind’s Oakfield project in Aroostook County and Patriot Renewables’ Saddleback Ridge in Oxford County, but those approvals are being challenged by citizen opposition groups. Patriot’s Canton Mountain project, also in Oxford County, is under DEP review. 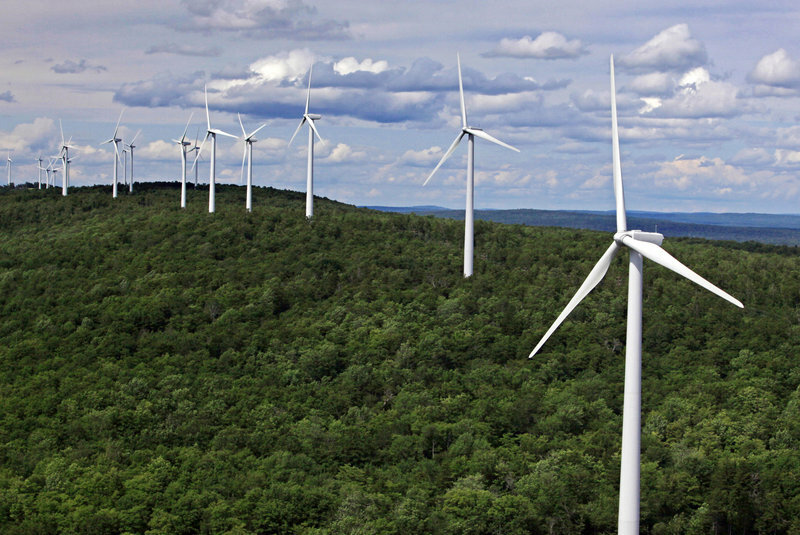 The Pisgah Mountain Windpower in Penobscot County also is being challenged. Independence Wind’s Highland proposal for a 39-turbine, 117-megawatt project in Somerset County has been withdrawn, and Noble Environmental Power LLC’s Passadumkeag Wind Park proposal in Penobscot County has been denied. Wind power produced in Maine is fed into the regional grid, but some stays in the state, Payne said. A 2011 power purchase agreement keeps Mars Hill power in northern Maine, and part of the Rollins wind deal was to keep power in Maine. “Developers stand ready to sign more of these contracts” to keep Maine-generated wind power in the state, Payne said.